From our position as the UK's leading GHG verifier, we are now using the same expert verifiers and rigorous auditing principles used in the regulated market (EU ETS) to measure and verify carbon footprints and GHG inventories for those companies who wish to voluntarily declare their emissions. We also verify 'carbon calculators' - energy performance calculators that are used by business clubs/industry organizations - to ensure that these are capturing the right sort of data and that this data is accurate. As part of their GHG reduction strategy, many organizations are setting Science Based Targets. Businesses can ensure they are playing their part in the global effort to limit global warming to well below 2 degrees Celsius by setting a science based target. Progress against science based target setting can be incorporated into the verification process if required. The Science Based Target Initiative (SBTI) is a collaboration between CDP, World Resources Institute (WRI), the World Wide Fund for Nature (WWF), and the United Nations Global Compact. We are accredited by UKAS to perform independent verification of voluntary carbon footprints assessed against the international standard ISO 14064-1. Have your verification done by us, to this standard, and you will be eligible to use this mark. Direct activities (fuels burnt, transport, process gas). Supply chain (distribution, raw material manufacture, consumer use, disposal). Why perform a Carbon Footprint? It can form part of an overall CR (Corporate Responsibility) or Sustainability/Environmental Strategy. It provides an excellent way of managing carbon emissions and energy use, helping you to reduce costs and limit your environmental impact. It signifies to shareholders, clients, NGOs, the general public and the media that your business is committed to being a responsible company in a sustainable world. It helps you to prepare and be ready, should mandatory reporting come into force for your area of business. A verified carbon footprint provides the backbone for carbon offset schemes, which in turn provide a route to "carbon neutral" status. As people look to be part of socially responsible organizations, it provides an excellent way of engaging, retaining and attracting staff. Why have your Carbon Footprint Independently Verified? Independent carbon footprint verification gives you the assurance that your carbon footprint data are accurate and consistent. Furthermore, being able to demonstrate that your carbon footprint has been independently verified satisfies your stakeholders' demands for accuracy, validity, materiality and transparency. Independent carbon footprint assurance is a key discriminator of real commitment and action, giving both your business and your carbon footprint credibility, thereby enhancing your market position. What Standards and Protocols are used for Carbon Footprinting? 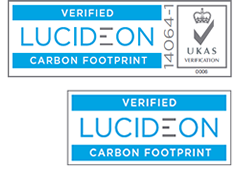 Lucideon works to the international transparent and uniform carbon footprinting standard ISO 14064 (Part 1). Lucideon is UKAS-accredited to ISO 14065:2007 to provide Greenhouse Gas (GHG) verification including for voluntary schemes that use an inventory addressing all of the requirements of ISO14064-1. We also now offer product carbon footprint verification against the new WRI/WBCSD Product Life Cycle Accounting and Reporting Standard (known as the 'Product Standard'). Complete management of the carbon footprinting exercise, from definition of credible scope and boundaries to compilation of calculation spreadsheets and verification of emissions back to source data. Third party verification of a carbon footprint assessment made by an organization. Advice on emission factors and uncertainty levels in reported data. Guidance on annual reporting to comply with ISO 14064 Part 1 and the WRI/WBCSD GHG Protocol.